Yahtzee is a time honoured game that’s been played in living rooms across the world since the 1950s and just like other popular card and board games, it’s now made its way onto the cyber waves of the Internet. 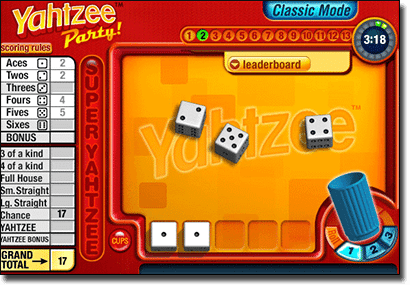 Traditionally played using a set of five dice, online Yahtzee allows the player to roll the animated dice with the click of a button, using computerised random number generators to determine the outcome of the roll, with the computer automatically keeping track of your score. This article will give you the rundown of how to play online Yahtzee and where you can play real money Yahtzee on the Internet. Where can I play Yahtzee online? You can find virtual Yahtzee at hundreds of sites across the Internet, from online card game hubs to social media sites like Facebook. A simple Google search will bring up tonnes of Yahtzee sites, while heading to the app store using your iOS or Android device will also give you many options for downloadable Yahtzee apps. As far as playing online Yahtzee for real money, unfortunately this is not yet an option at any of our recommended casinos. Given Yahtzee’s history as a family friendly game usually played purely for recreational purposes it is not considered a traditional gambling game, but as more recreational games are starting to emerge as real money casino games we expect that leading casinos will soon start to add Yahtzee to the repertoire. In the meantime, you can hone your skills playing Yahtzee for free online. Alternatively, if you have access to five standard dices, you can start practicing in real life. 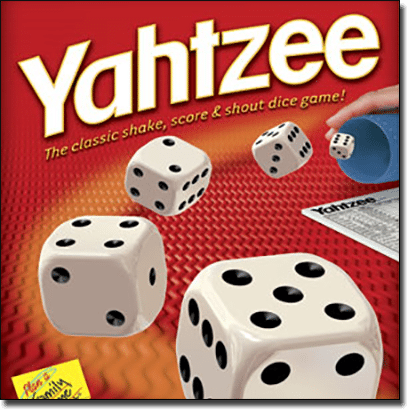 Yahtzee is a dice game that was first created by board game leaders Milton Bradley in America in the 1940’s. It’s a game of luck which is a blend between other popular dice games Yacht, Generala and Poker Dice and it’s often noted to benefit from similar skills and strategies employed in blackjack and poker. It can be played as a solo game but is best played with two or more players. The aim of the game is to roll five dice at once in order to produce the highest score possible. Yahtzee consist of 13 rounds, with a different category for each round consisting of its own set of rules for scoring. For each round, the player can roll the dice up to three times in an attempt to get the highest scoring combination for any of the 13 categories. The game ends when all 13 categories have been completed and the player with the highest overall score is declared the winner. Playing Yahtzee online makes it easier to keep score, without the need to manually complete scorecards on pieces of paper. You can choose to play against the computer or against other players from around the world, including your own friends and family when using Yahtzee apps. For each of these categories, the score is made up of the sum of how many of that number appeared multiplied by its relevant category. For example, if you choose fours and roll a 2, 4, 4, 4 and 3 the score will be 4 X 4 = 16 points. Points are scored differently for each category in the lower section as detailed below. Some games also employ a special Yahtzee bonus rule where further points are accumulated if a player manages to roll multiple Yahtzee’s (five of a kind). Refer to the rules of the specific game you are playing to determine what rules are in place for the Yahtzee bonus.